Nichola Groom for Reuters: The U.S. solar industry would see two-thirds of expected demand dry up over the next five years if a trade case aimed at propping up the domestic panel manufacturing industry is successful, a new report said on Monday. The utility-scale solar industry, which accounts for more than half of U.S. installations, would be hit hardest if Washington adopts the hefty remedies sought by bankrupt solar panel maker Suniva. That is because large projects depend on being cost-competitive with natural gas-fired plants to spur buying, research firm GTM Research said in their analysis. 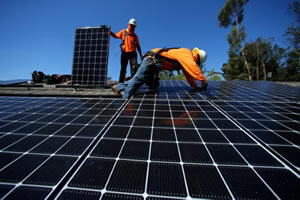 "This is arguably one of the biggest downside risks to the future of U.S. solar," GTM's associate director of U.S. solar, Cory Honeyman, said in an interview. In April, Suniva filed a rare Section 201 petition with the U.S. International Trade Commission nine days after seeking Chapter 11 bankruptcy protection. In the petition, the company asked for new duties on imported solar products to combat a global glut of panels that has depressed prices and made it difficult for American producers to compete.